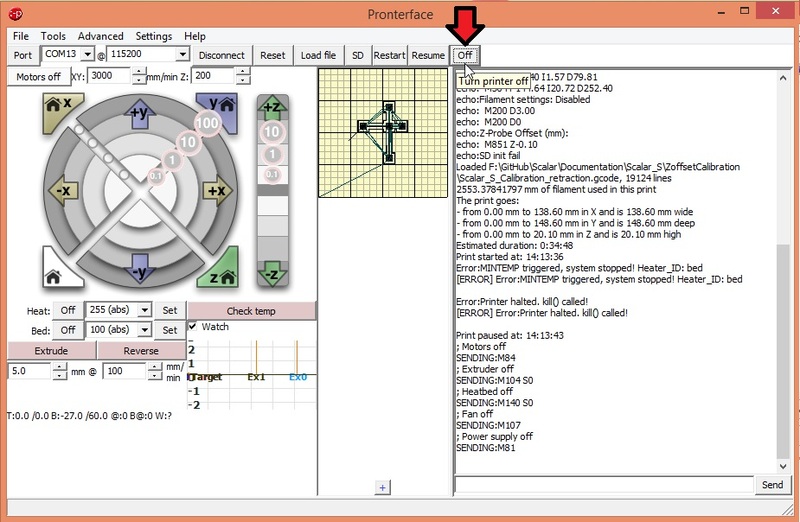 This article present you the procedure on how to set your ZOffset without any LCD screeen on your Scalar S 3D Printer. This article presumes that you are using Marlin firmware (RC8 or newer) and a Scalar S 3D printer without LCD screen. Push the « Connect » button to start the connection. 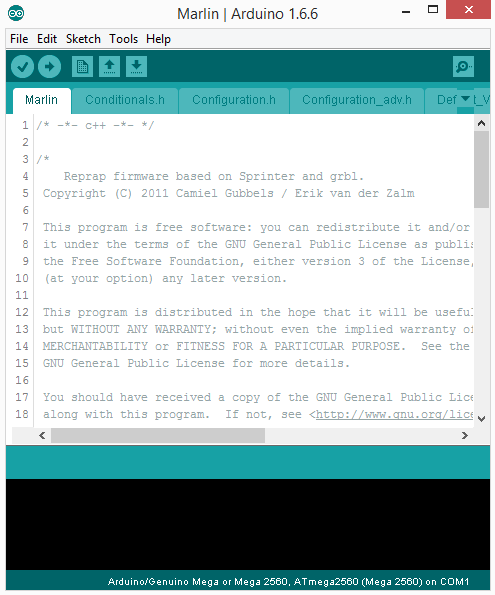 If the connection is working properly a list of text and parameters should be displayed on the console output on the right side of the application. 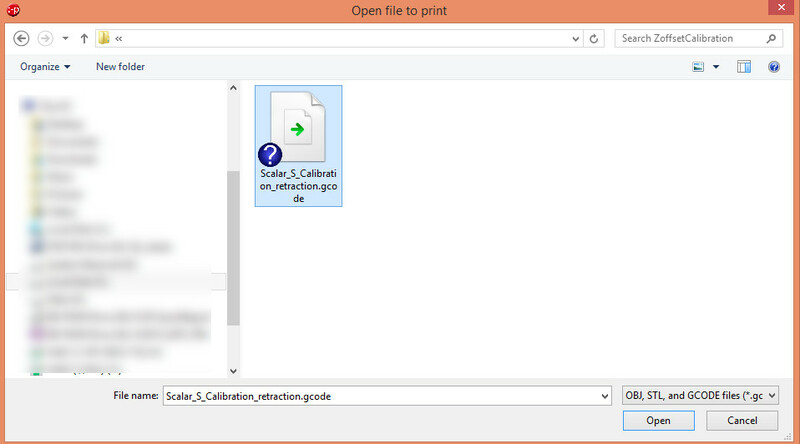 In order to adjust Zoffset we are going to print a calibration part compatible with Scalar S and a 1.75mm filament. Here we show how to change the Zoffset by typing command M851 Z-0.3 into the console.We send the command to the printer using the « Send » button located at the right of the text input field. In order to lower the nozzle on the first layer your ZOffset must be « Negative« . 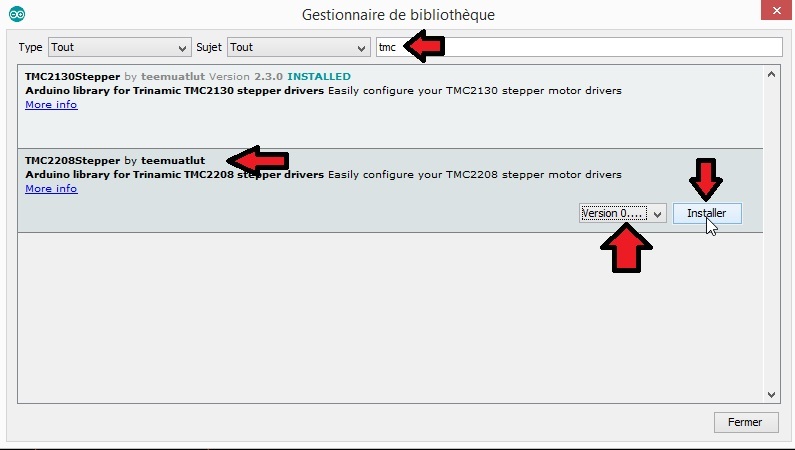 Cette entrée a été publiée dans General Documentation, Scalar S, et marquée avec ABL, auto bed leveling, Scalar S, ZOffset, le 13 June 2017 par Nicolas Rambaud. A 3D Printers is a production tool. As such they needs to be dealt with caution mainly by adults with no mental handicap. The end user must have a general knowledge of the machine before using it and a special training might be needed in order to use a production tool. Kids must be assisted by an adult in order to prevent any accident with the machine. Information on this page have been obtained via sources that we feel are reliable, but might be subject to some later updates / changes. The way to use, store or build the machine is up to the end user. As such we cannot control the use/build and storage conditions of the machine. We are not responsible for any damages, accident or any other storage / handling related issues, as well as recycling means of the machine. 3D printers are using different kind of materials from different origin and composition. 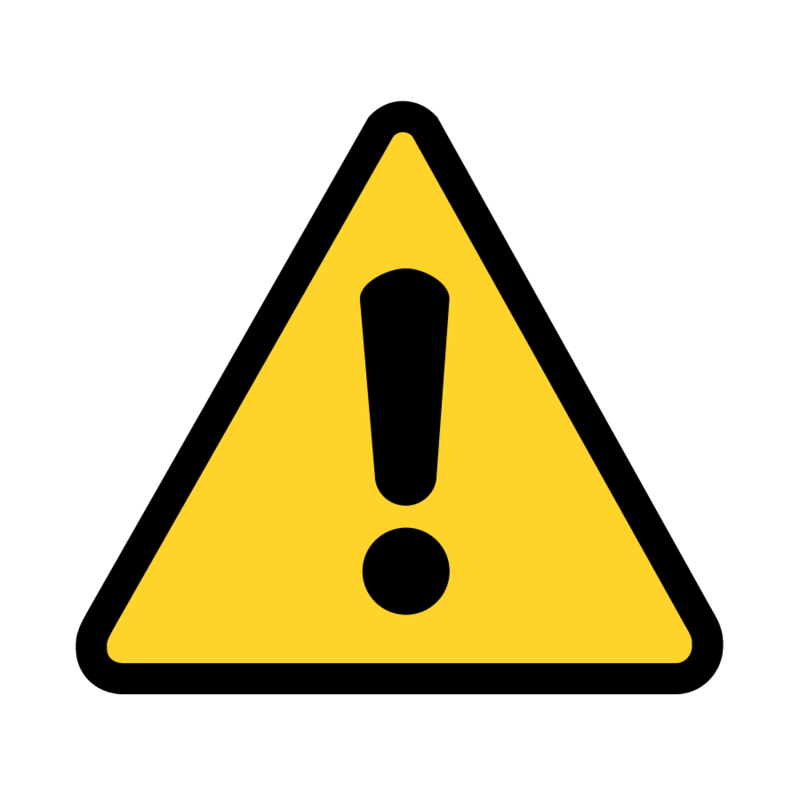 Depending on the material,additives, and colorants, the toxicity of the filament may vary. PLA; Recognized to be safe and non toxic in it’s natural form, some precautions are to be taken when adding additives or lubricants inside the filament. ABS: Recognized as toxic, based on the micro particles it’s emits during the print process. The amount of Styrens and other products generated by the carbonization or certain chemical products, can even form cyanides and other toxic materials.More over a strong smell is created when printing ABS. Always use your printer inside a well ventilated room, or with a proper air filtration system. Not all carbon active filters are working. Please refer to a proper Gaz filter, as Carbon filters from extractor hoods are not fit to filter ABS micro particles. Never burn 3D printer filament as it can quickly decompose into toxic material when exposed to flame. Scalar 3D printers are DIY kits provided with no additional protections. As a kit, it cannot be considered as a finished consumer product. CE marking depends on the way the machine was built . As such the following notes must be taken into consideration. 3D printers are using 12VDC (very low voltage). This voltage range is outside the scope of the low voltage directive. Always unplug the power supply from your power outlet before doing any maintenance on your machine. Electromagnetic radiations in conduit mode for distributors is not an issue as it is mainly linked to the Power supply. The electromagnetic compatibility depends on the quality of the assembly, and might need some additional shielding but cannot in any cases be predicted. 3D printers contains a lot of moving mechanical parts, and the torque of the stepper motors is relatively low and should not cause too serious injuries. The easiest and fastest way to secure your machine is to place it inside a closed and well ventilated room with and air extraction system, or to use a box that cover your whole printer with some security access doors. 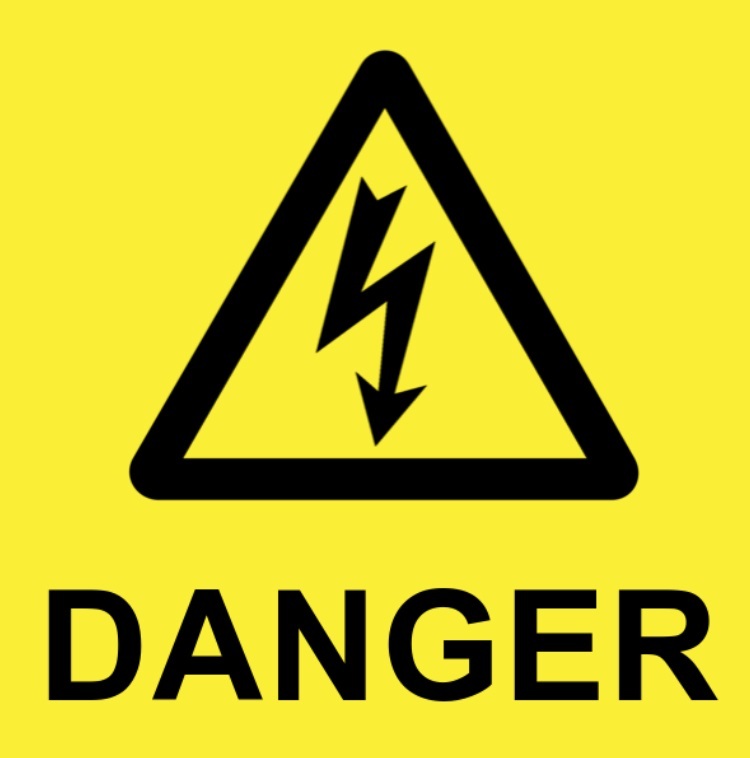 In order to improve the electric safety of the machine, you might need to add a power switch that cuts off the power when the printer door is opened. The safety measures for the machine is up to the end user. Always unplug the main power supply from the grid when doing any maintenance or intervention on the machine. The machine has several heating elements that can reach 140°C for the heat bed and more than 300°C for the hot end. Burn threat is real and have to be taken into serious consideration. Some hot ends are provided with silicone insulators, that will lower the burn issues. However it might be required to add additional security measures depending of the use cases. If you get burnt, you can use Organic silicium G5 Immediately after the burn. This gel is very effective when applied immediately after the burn. More over it’s hydration capabilities makes it great to repair and protect your skin. Cette entrée a été publiée dans General Documentation, et marquée avec instructions, Safety, scalar, le 28 December 2016 par Nicolas Rambaud. Standard 30x30mm extrusion profile. They exist with a 8 or 6mm groove. This type of extrusion profile is compatible with TNuts made for each groove size. These are 20x20mm .They exist with 5mm or 6mm grooves. They are also compatible with a big range of accessories. They are also lighter and cheaper than the 3030 extrusion profiles. They are also 20x20mm. They have V Shaped grooves. Cette entrée a été publiée dans General Documentation le 21 November 2016 par Nicolas Rambaud. 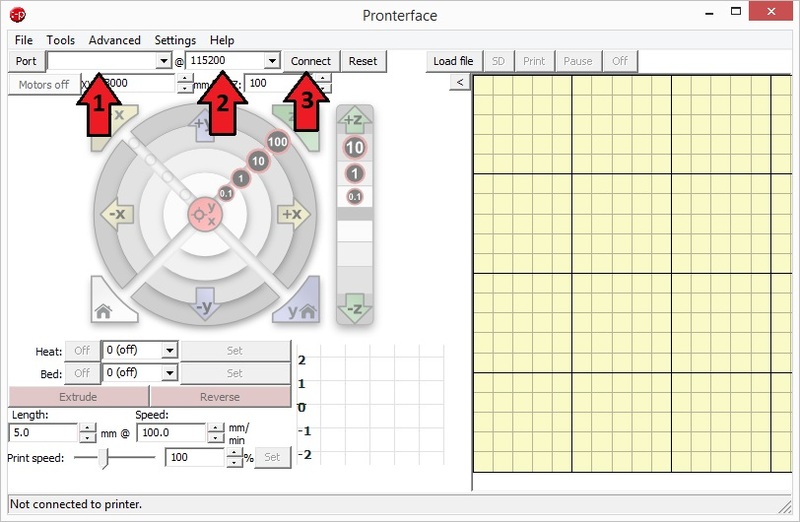 Temperature management by your 3D printer is often made using PID controller. 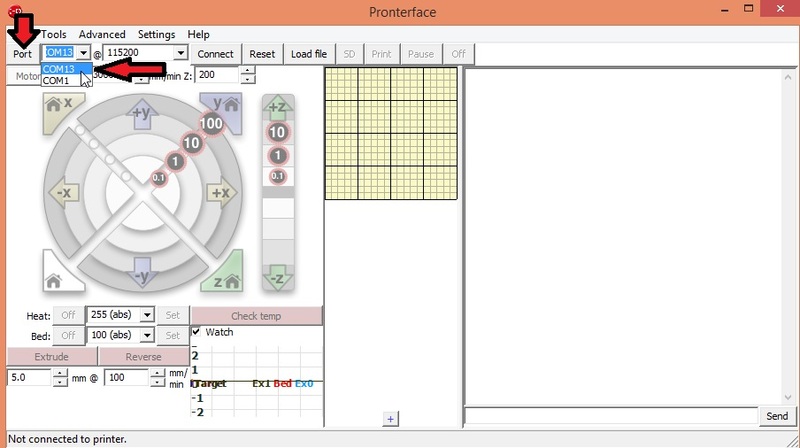 Pronterface is a cross platform host software for your 3D printer. 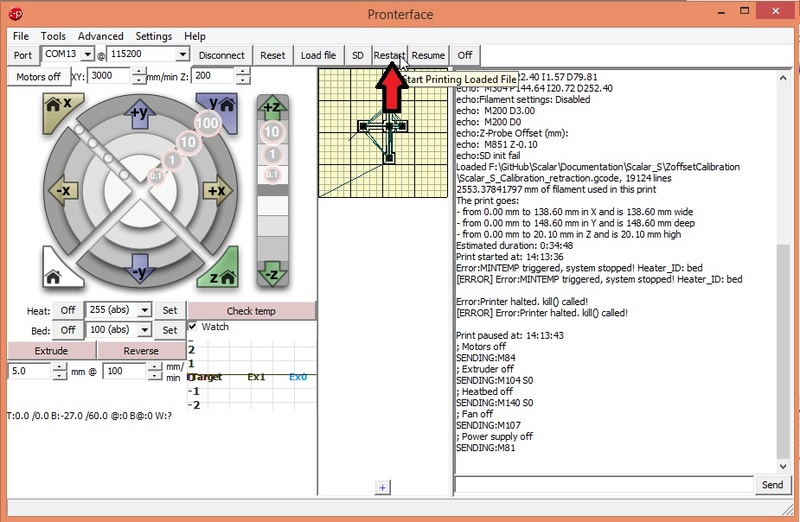 It allows to send commands to your 3D printers in a simple way. In order to be able to connect to your 3D printer you need to install the serial drivers of your electronic board. Scalar 3D printers are using arduino MEGA 2560, so you only need to install Arduino IDE in order for the proper drivers to be installed. Once you have downloaded the proper version of Pronterface , you will need to unzip it’s content in a folder. Inside you should have the following file tree. At this stage you will need to connect your 3D printer using a USB cable. Once the drivers are installed, your OS will assign a specific COM port to your 3D printer. Once connected you should have a lot of information coming into the console window on the left side of the application. PID auto tune has to be made when your heating element is at Ambient temperature. Otherwise you will get wrong parameters! E0 is for Extruder 0 (your hot end) , S210 is the target temperature (here 201°C) and C8 is the amount of iterations to perform , Here 8. The higher the number the more accurate your PID will be. you will need to wait a few minutes in order for the algorithm to converge to a set a values. Make sure you have updated the command with the PID values that you found! Cette entrée a été publiée dans Electronique, Extruder, General Documentation, Lit chauffant le 7 November 2016 par Nicolas Rambaud. It is possible to generate a certain amount of Audio sounds by modulating the output signal of the Display Buzzer. M300 Gcode command allows to do just that. Can I find existing sounds/musics? There are some tools that already exist. 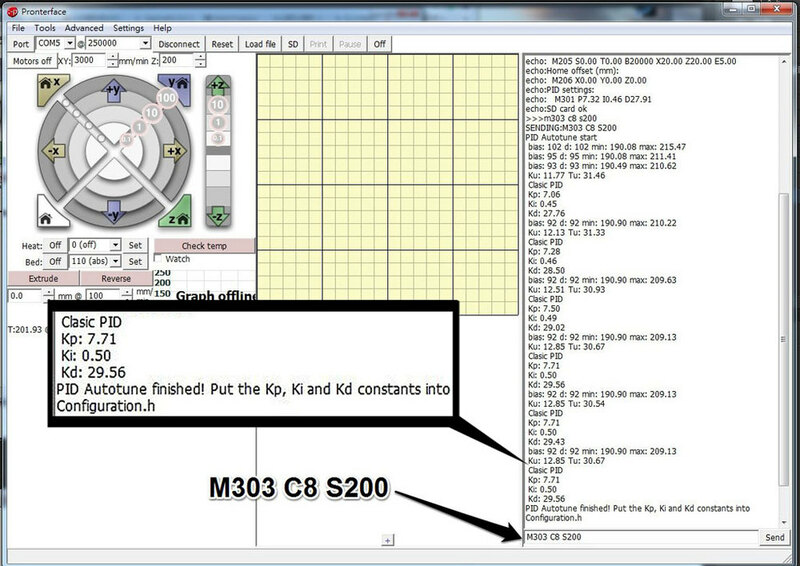 They allow you to convert any RTTTL format ringtones into M300 compatible Gcodes. 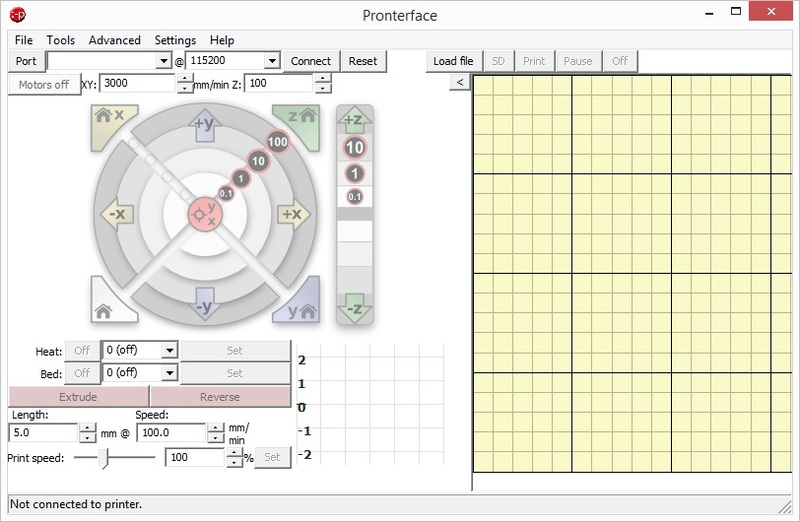 You can find one here: : http://ddrboxman.github.io/RepRapRingtone/ , it’s an online generator that can convert Ringtones into M300 compatible Gcodes. This generator also allows to render the audio output of each convertion. Each converted file has Gcode extension. Each .Gcode file is a simple text file that you can open and edit with a standard text editor such as notepad++, notepad or any other. 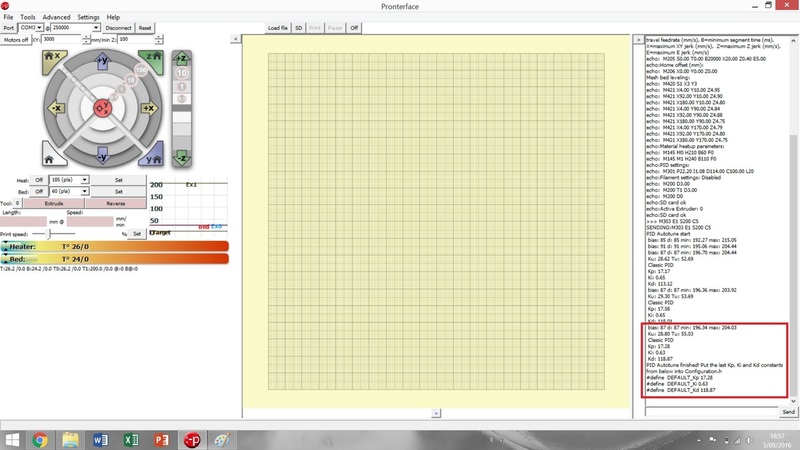 Each slicer should allow you to customize at least the start and the end of your gcode. The part that we are looking for is to customize the end of our gcode, so that the music will play once the print is over. The sollowing example is done using Cura . In the Tab section of cura you will see « Start/End-GCode« . Then a text zone will appear at the bottom with some text in color. This text are the actual instructions used by your 3D printer when the print is finished. Now you only need to copy/paste the content of your M300 converted ringtone file into the end of the text editor. now you can slice normaly any 3D object you want, your music will be played at the end of each new prints. How to easily test your converted files? So it’s very interesting to test those songs before using them everywhere. You can copy/paste the already converted files (with .gocde extention) into a SD card and play them directly from your LCD display. Due to some memory restriction, firmwares are often limited to display a maximum amount of files per folder. Adding directly the 11 000 files inside a single folder will most likely crash your firmware when it will try to list all the files. So it’s advised to only test a pack of 20 or 30 files max per forlder. Cette entrée a été publiée dans Electronique, General Documentation, Imprimantes, et marquée avec audio, Gcode, M300, music, Ringtone, RTTTL, le 9 February 2016 par Nicolas Rambaud. Commonly called « Z Woobble » on most of reprap forums, this phenomenon is very frequent when you assemble a reprap 3D printer. Often, this phenomenon can appear after a while whithout even knowing why or what we did. There are always at least 1 or many reasons why this happens. When we have this effect at the begining it can be time consuming or challenging to find out how to fix it. A deposit 3d printer, is printing layers on top of the previous layers. In a perfect world, all the layers are perfectly aligned and we have a perfect wall finish. In reality, we can often have Z Wooble, it means that the layers are miss aligned and we have some « waves » on the sides of the prints. If we look closely under light we can see a periodic pattern repeating itself. If we look even closer we can see that the layers seems to be layered correctly but the height of each layer may vary slightly. Le plastique s’écrase par moment et se détend à d’autres endroits. If we place our threaded rod in front of a long print we can clearly see the pattern matching with the thread. The identified causes so far are numerous, that’s why we can often accumulate them, making things challenging to fix. Threaded rod are not parallel to themselves or to the guiding smooth rods. The X belt tensioner is applying force on the Z axis smooth rods instead of the X axis smooth rods. THe smooth rods will then bend slightly enought to generate the issue. The extruder is not calibrated. (EStep/mm not calibrated),The amount of plastic is too much or not enought making the plastic deposing irrugular. The X carriage is not moving smoothly on the Z direction. One of the side is moving before the other side and the movement is not linear anymore. Auto bed leveling is compensating too much. meaning that one of the Z axis side is higher that the other side based on the heatbed. Use a flat object in order to adjust the height on both sides of the z axis to greatly diminish the compensation of auto bed leveling. The filament is periodically blocked, impacting the plastic flow. The extruder is sleepering on the filament. This impacts the plastic flow. The layer height is too high or too low according to your nozzle diameter. The filament diameter is not uniform and may vary a lot. Here again the plastic flow will be impacted. One of the Z axis nuts have slack. At least one of the nuts or the threaded rods are worn.In this case the best is to change both Threaded rods and Nuts on both sides. The top of the threaded rod is constrained/ Threaded rods are never perfectly straight. constraining the top of the threaded rods will impact the guiding rods. Freeing the top of the threaded rods can fix the wooble effects. Feel free to come back to us if you know some other causes and possible fixes. Cette entrée a été publiée dans Axe Z, General Documentation le 4 February 2016 par Nicolas Rambaud. This page is dedicating to upgrading/updating your marlin firmware for your 3D printer. 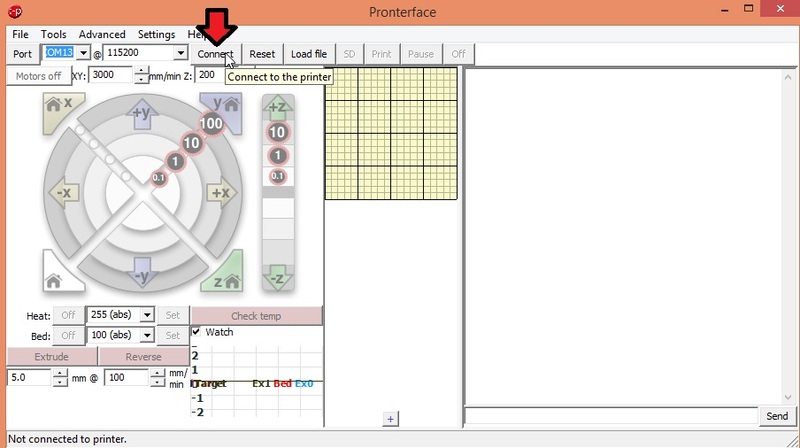 Here we will also show what settings to use for Scalar XL 3D printers, but the main idea stay the same for any other printers. Be advised however that the philosophy can be slightly different for Delta 3D printers and that you might look for another type of guide if you own a Delta 3D printer. Also the described marlin firmware is from 2015 August 24th so if you want to update to a newer version be advised that some modifications might be needed that are not covered on this guide. Unzip the firmware on your hard drive. After installing the tools above, you will need to download a copy of the marlin firmware. Warning! No support will be made from us on this feature! A proper APU is needed with a TTL output is greatly advised for this feature. After having installed it, execute it. 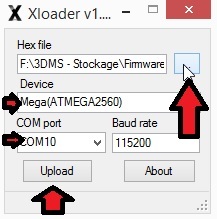 In order to make it easier for you to find the proper location on each feature inside the firmware, you might be interested to enable the line numbers on the IDE. now the line numbers should be visible on the left of the editor. Special Note: The lines numbers are valid for firmware version 1.0.0. For other firmware versions the lines might change a little bit and some parameter names might even slightly change. 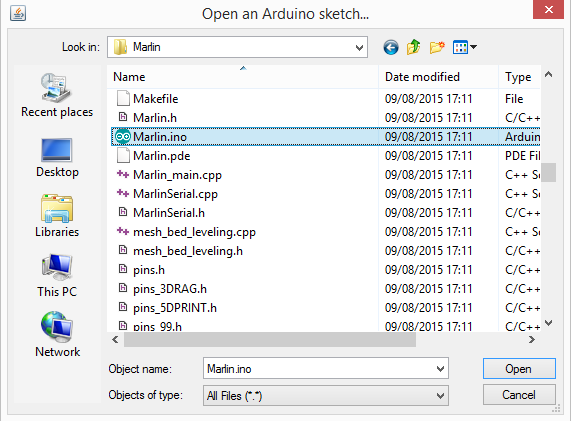 From the Arduino IDE you will need to open « Marlin.ino » that is the firmware main project. It’s really useful for you to increase the size of the window in order to better see the line of codes later on. To expand the window size click on the increase size on the top right corner of the application. 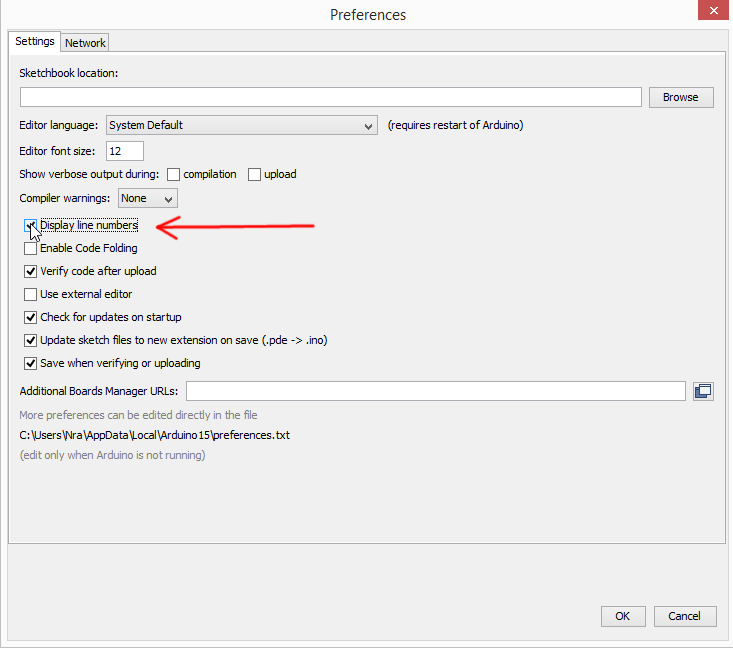 Now you will need to setup your ide in order to properly select the output platform. 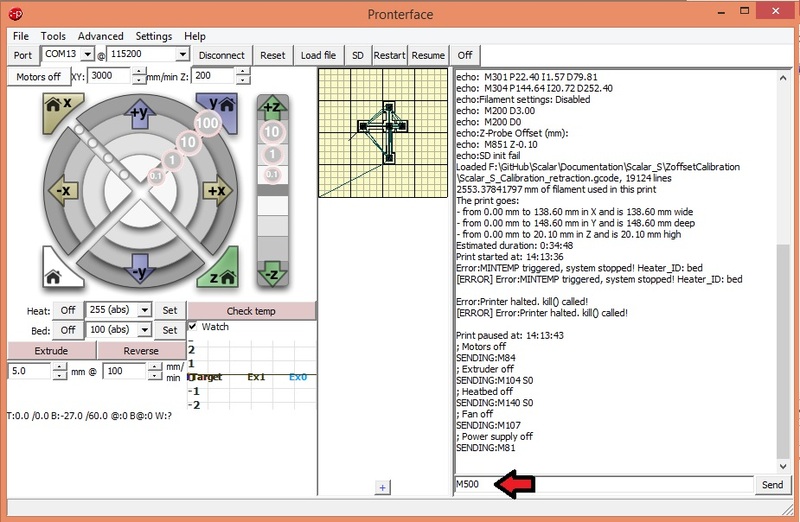 Now connector to your 3D printer USB port and make sure that the arduino is properly detected by your pc. From this you are set to go to the next step. Dig into the firmware mysteries! Now in the text editor you will see appearing a lot of text. 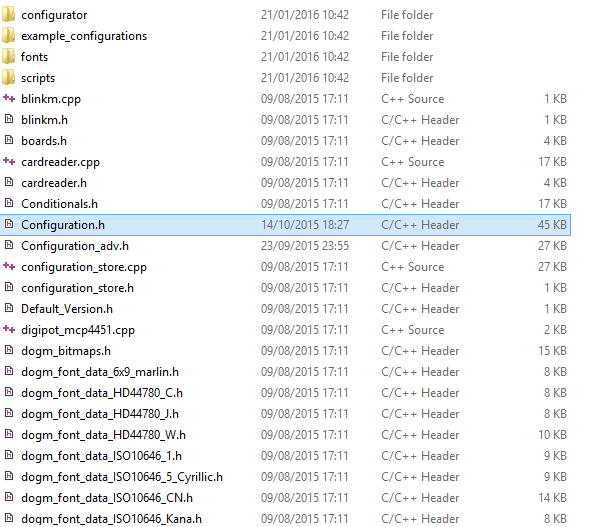 This file mainly contains all the configuration parameters for your printer. the lines in color are active while the lines in grey are comments. Comments are lines starting with « // ». they are often greyed. Also a comment can be added at the end or middle of a line. In that case the beginning of the line will be colored and the remaining part past « // » will be greyed. The greyed part is also considered a comment. Comments are very useful in order to give a lot of relevant information about the specific meaning of each settings. Parameters are often defined following a « #define » keyword. Once uncommented the parameter following the #define will be active/enabled. in order to tell the firmware which thermistor we are using we need to select the proper thermistor table for both hot ends and heatbed. These tables can be selected near line 146. In this example you see 5 parameters related to temperature sensors. The 4 first ones are linked to hot ends. The last one is used for heat bed only. For scalar XL depending if you are using AllInOne hot end or E3DV6 you will need to use a different thermistor table for TEMP_SENSOR_0. The PID, also known as « proportional–integral–derivative » controller, is used to control the heating element temperature. Near line 194, you have the ability to enable/disable PID functionality. It’s better to use PID mode for heating element that are compatible with this mode of heating such as Hot ends and 220V heat beds driven by SSR. Avoid using PID mode for standard 12V 200W heat-beds because the power supply might not handle it very well. PID control is great if you want a stable reliable temperature control. 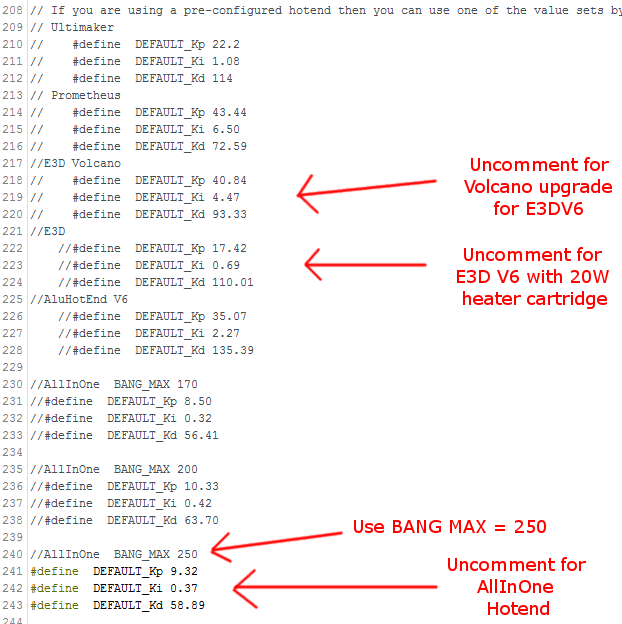 If you just need a more simple way to drive the heating elements, then use Bangbang mode and disable this « #define PIDTEMP » parameter. In this mode when the temperature is low, the BangBang mode will be used. Once the temperature is close to the target temperature (this can be configured in the settings) the PID mode will be used. This mean that the hot-end will be very fast to reach a temperature close to the target temperature, but it will slow down at the very end in order to avoid possible temperature overshots. This parameter is located around line 195. If you have a hot-end with a 40 watt heater cartridge, you can lower down a little bit the BANG_MAX value. Here is an example used for the AllInOne hot-end. Near line 210 you will reach a section where you will be able to define the PID constants. On this example you can see that many PID values are commented and only 1 set of values is left uncommented. 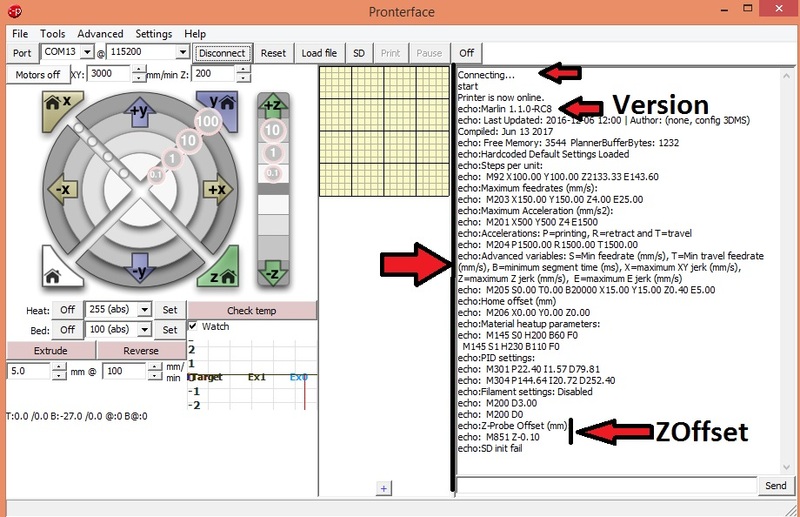 Check what hotend you have and uncomment the 3 set of values corresponding to your hot-end. For E3D hot-ends, as they are using 20W heater cartridge, you will need to previously set BANG_MAX to 255. For AllInOne hotend, you will need to lower it down to 250 in order to avoid big overshot. 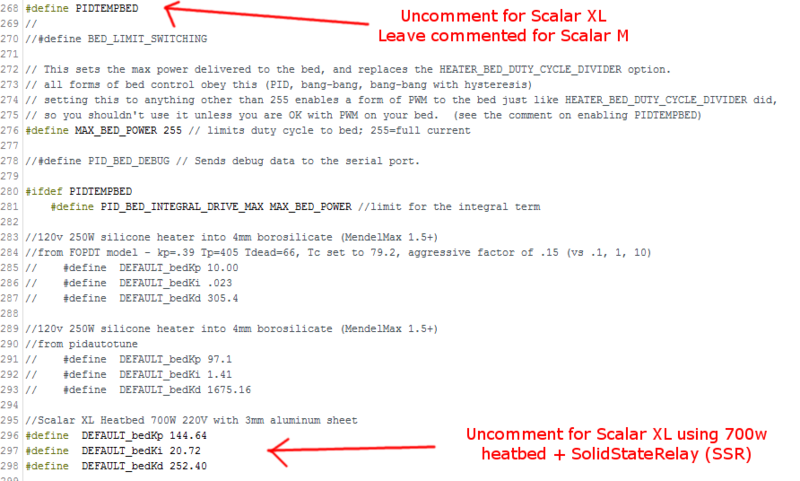 Near line 268 you should find the parameters to enable/use pid function for heat-bed. Note that depending on the type of heat-bed you are using, BANGBANG mode might be more suited. Indeed, if the heat-bed (often 12V heat-beds) is directly linked to the power supply, using PID mode might crash trigger some safety on the power supply side. However if you are using a 220V driven by SSR (solid state relay), PID mode is something you can consider. then select which heatbed you are using, in our case here we are using 700W 220V silicone heater mounted on a 3mm 435x320mm aluminum sheet. Near line 307, just below PIDTEMPBED block, you should find settings related to extrusion safeties. #define PREVENT_DANGEROUS_EXTRUDE parameter will allow extrusion only when hot end is hot enough using EXTRUDE_MINTEMP parameter at line 311. 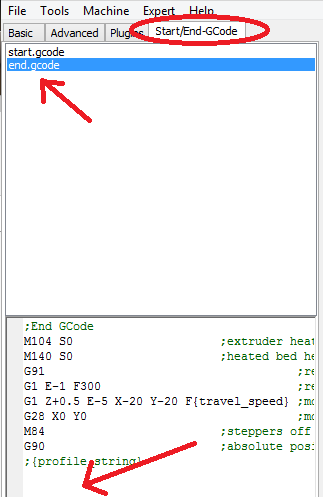 If you hot end is below this temperature, extruder won’t move at all. #define PREVENT_LENGHTY_EXTRUDE will prevent extrusion if a single gcode command is asking for a very long extrusion (more than 200mm). A mechanism is available to detect if the heating elements are heating properly during all the print duration. If the firmware detects any abnormal drop of temperature for a certain amount of time, an error message will appear on the LCD (THERMAL RUNAWAY), the print will stop and all heating elements will power off. This protection is available for both hot end and heat-bed and you can enable 1 or both independently. Near line 476 you have a whole section dedicated to Auto bed leveling (ABL). This section is responsible for managing the G29 gcode. On scalar 3D printers, it’s also responsible for using the induction probe. At line 476 you can enable/disable this feature. line 477 #define Z_PROBE_REPEATABILITY_TEST is used in order to double each measurement using slower speed the second time to increase measurement precision. 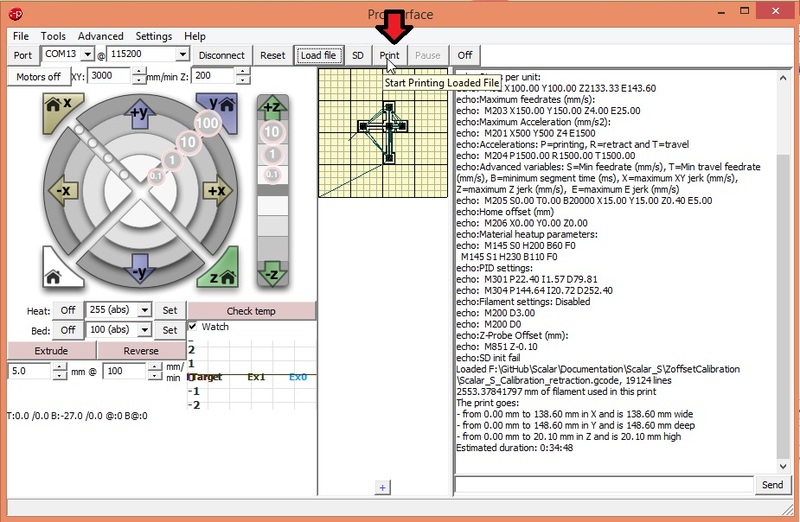 Block near line 498 are the coordinates of each probing points when using Grid mode. Just a little bit below, near line 525, you will find the offsets used by the firmware to determine the induction probe location from the nozzle tip. You will also find a few parameters that you can adjust if you want to tweak how fast the auto bed leveling mechanism is going. Note: if you decrease too much those values you might encounter some troubles or even crash the nozzle into the heat-bed while moving to the next probing location. Depending if you are using Belts, threaded rods, trapezoidal lead-screws, etc… you might need to adjust the amounts of steps required in order to move 1mm or your printer won’t move the proper distance. All parameters with ACCELERATION really depends on you mechanics ability to move fast, accelerate fast and decelerate fast. line 649 #define EEPROM_SETTINGS is used in order to enable EEPROM support. EEPROM is the internal memory of the arduino board. it’s a non volatile memory used to keep the important adjustable settings into memory for later use. 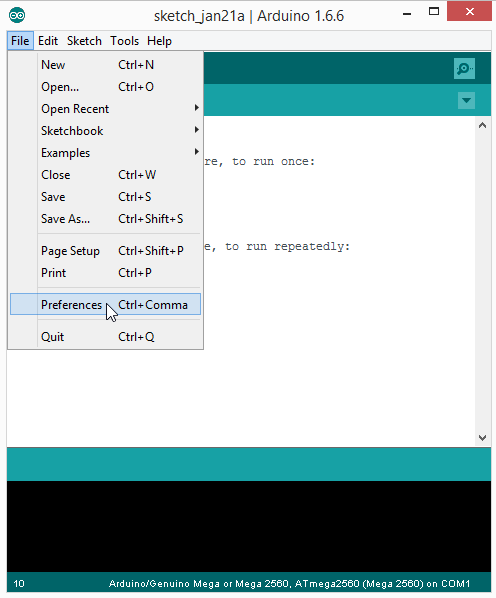 Most of the settings available from the LCD display are stored inside the EEPROM of the arduino. Blocks near lines 659 are pre-heat presets for PLA and ABS. here you can setup your own. the default ones are shown on this example. The section dedicated to the MQ2 smoke sensor is located at the very bottom of the configuration.h file. There line 863 #define MQ2_GAZ_DETECTOR will, if left commented, disable the smoke detection module. If un-commented, it will enable the smoke detection module. When enabled, the next settings can be active. 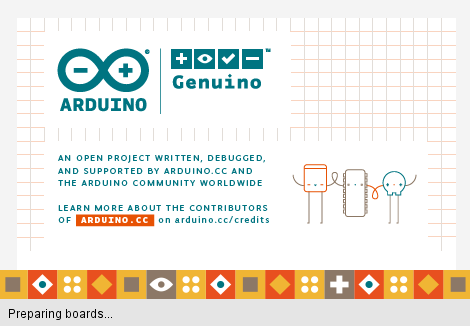 line 869 #define MQ2_PIN is for advanced users if you want to use a spacial arduino IO pin. By default we are using pin 57 (A3/D57 from AUX1 on Ramps 1.4) because it’s capable to be used in both Analog and digital mode. You can use any other IO pin but make sure it’s compatible with the sensing mode you are using. line 872 MQ2_ALARM_TRIGGER_KEVEL_PPM is used when the sensing mode is used in ANALOG mode, meaning we are using the ANALOG output of the MQ2 sensor. In this mode the analog output voltage will vary depending on the sensor detection. In ANALOG mode, the blue trim on the sensor cannot be used, so in order to adjust the sensitivity of the sensor, the firmware is using a table that convert the output voltage of the sensor into PPM. When this PPM value is reached the alarm will trigger. If you want more information about what value to use for your specific MQ2 module (each module is slightly different), enable parameter « MQ2_VERBOSE » at line 867, connect your printer to any host software and read the console output. A lot of values should be listed when you apply some smoke or gas to the probe. In order to prevent false alarm, the firmware is taking several measurements in order to make sure the sensor output is stable above the trigger level. Parameter MQ2_CONFIRM_COUNT is used for that purpose. Feel free to increase or decrease the confirm count to your liking. Increasing this value too much will reduce the reactivity of the alarm but will ensure that a real threat is detected. A few warning levels are possible for this module. Each of these warning levels (except the first one) can be enabled/disabled at will and can be combined. Before uploading your sketch it’s a good idea to first check that the code and settings have a proper syntax. 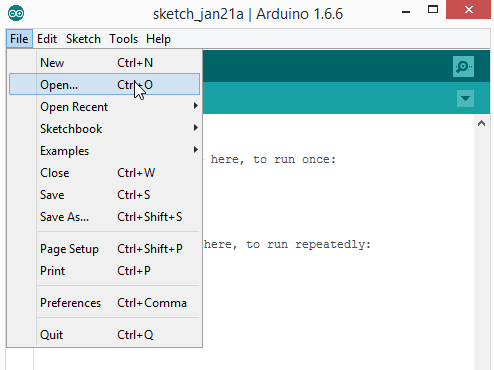 On the top left corner of the Arduino IDE, you will find a round button with a « check » mark on it. 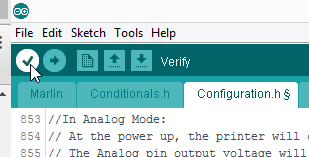 If everything is ok and no error message appear, you can now upload this version of the firmware to the arduino. To do this you will need to click on the button located right next to the « verify » button, the one with an arrow going from the left to the right. 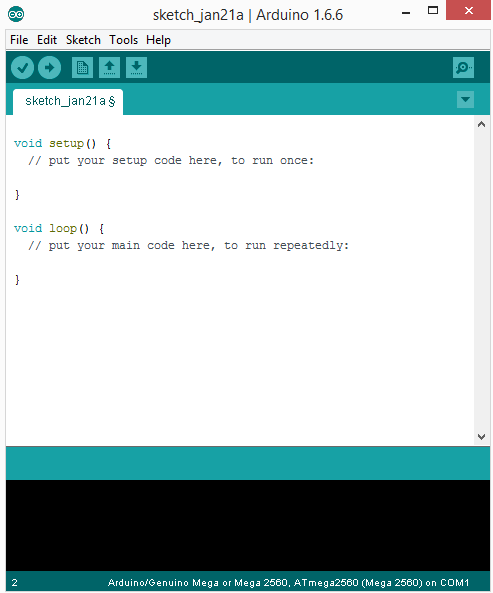 The ide will compile again the code and will then upload the firmware to the Arduino. The process is similar but will take longer. Note that the progress bar might get stuck for a while but the upload process will still be running. 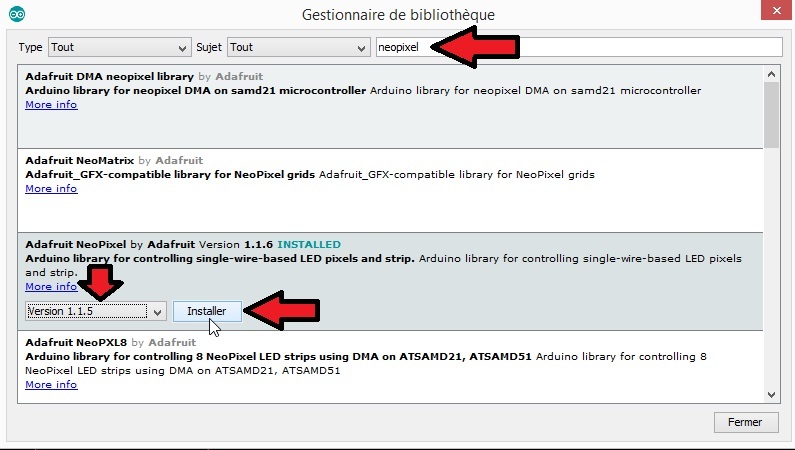 On your arduino board a flashing led will appear, meaning that everything is in progress. Once done an explicit message at the bottom of the IDE will appear, and the flash led will stop. 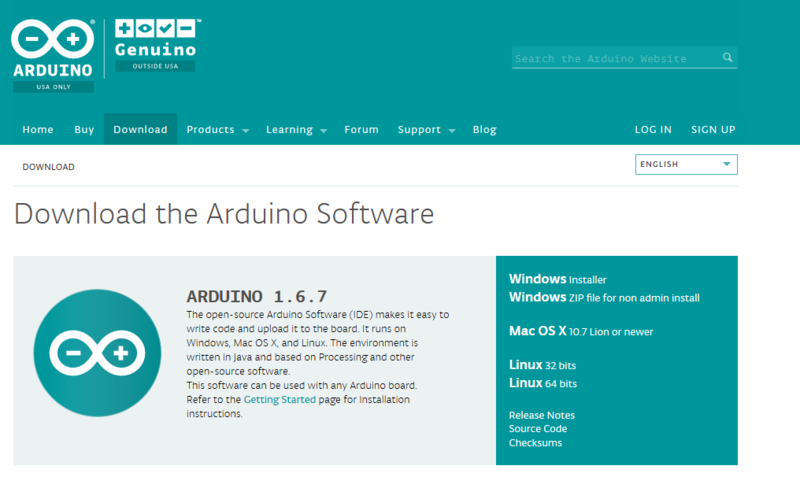 At the end your arduino will reboot and your new firmware and settings will be available on your arduino. 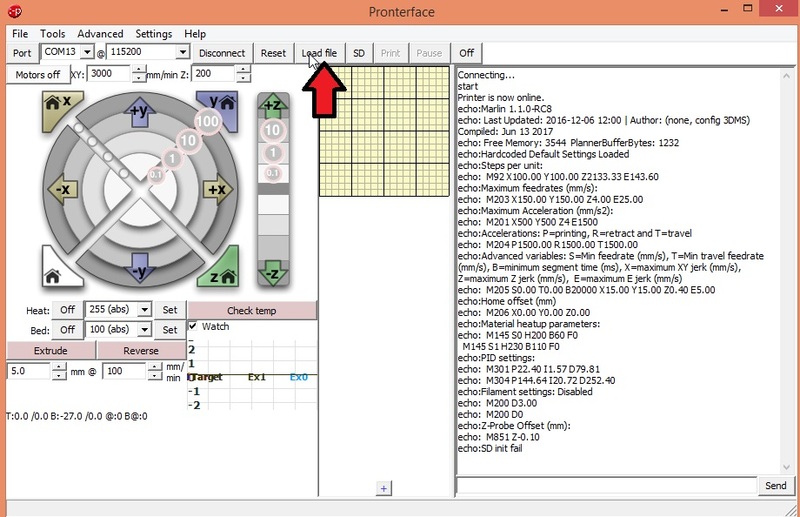 If you already have the EEPROM enabled on your 3D printer (it’s the case for Scalar 3D printer users), all settings stored in the EEPROM will still be active. More generally, If you have changed any other settings that is available from the LCD display. Before doing that, make sure you have saved/written down somewhere your « ZOffset » parameter, as it will also be overwritten by the restore fail-safe operation. 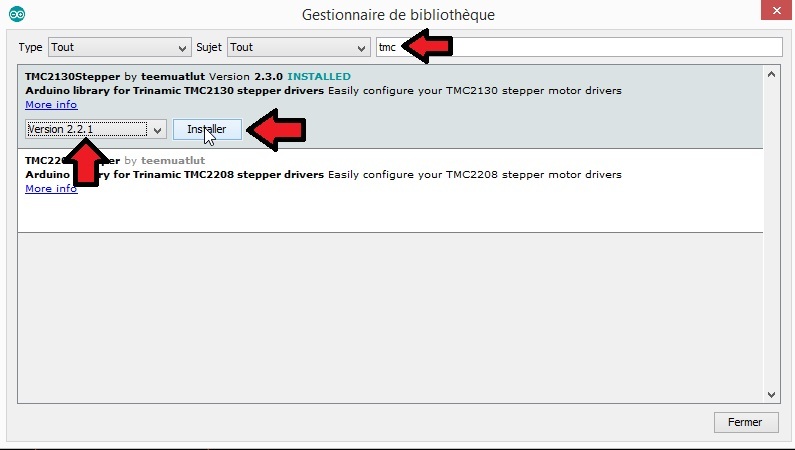 Cette entrée a été publiée dans General Documentation, et marquée avec 1.1.5, 3D printer, firmware, marlin, PID, RC8, thermistor, update, upgrade, upload, le 23 January 2016 par Nicolas Rambaud. A lot of questions can rise when it comes to tweaking our slicer parameters. Adjusting the layer height value to have the best possible quality can become tricky. What is the Max and Min layer height for my printer? To answer this question we need to take into account the nozzle size of your hotend. Printing with a layer height too low might cause the plastic to be pushed back into the nozzle and the extruder will struggle to push the filament. In the worth cas the plastic can expand/react/change state inside the hotend. Depending on your extruder, it can also damage the filament preventing it to properly push the filament. Also in the opposite situation, if the layer height is too high, the layers won’t stick properly to the previous layer resulting in a poor finish/poor rigidity of your 3D model. 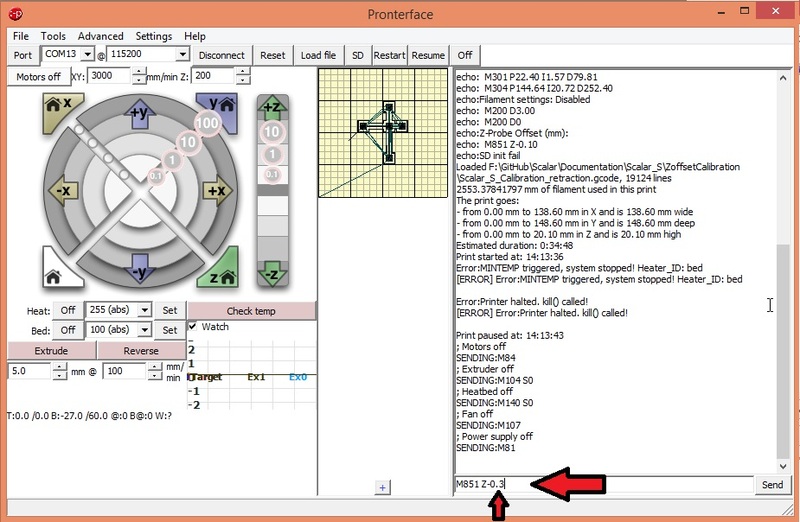 Once you have this calculated you can test to print a calibration pattern and adjust the layer height slightly. This calculator helps to determin if the amounts of steps performed per layer height is an integer value. As the firmware is only able to drive an integer amount of steps, using a layer height requirering a float value will cause a potential cumulative error (depending on the firmware) and the total height of your printed part can be smaller/higher than expected. Those values will work for machines having a M8 leadscrew , 1/16 micro stepping and 200 steps/turn stepper motor (1.8°/step). They might also work with other hotends having the same nozzle diameters. 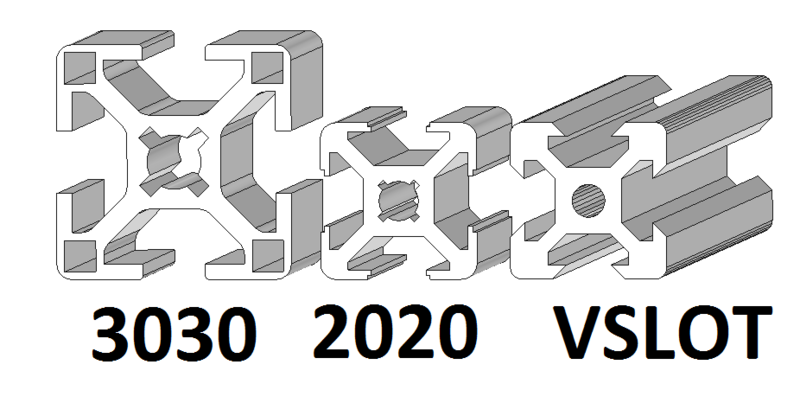 Those values will work for machines having a Tr8x1.5 trapezoidal leadscrew, 1/16 micro stepping and 200 steps/turn stepper motor (1.8°/step). Those values will work for machines having aSFU1204 ballscrew, 1/16 micro stepping and 200 steps/turn stepper motor (1.8°/step). Use them as a starting point to calibrate your printer. 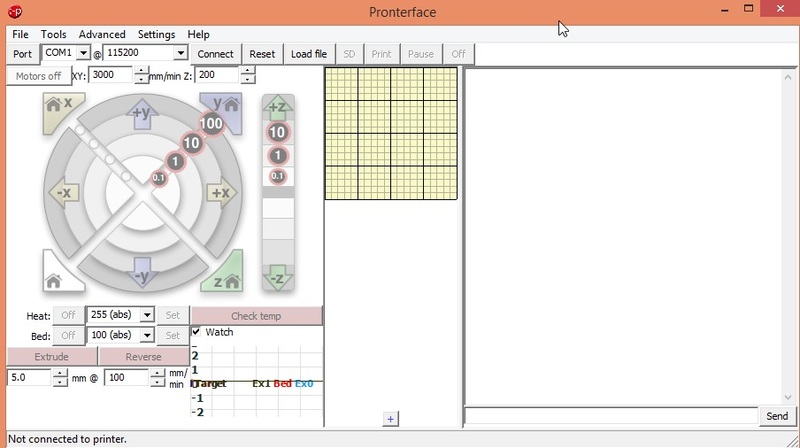 Cette entrée a été publiée dans General Documentation, Non classé, et marquée avec 3D printer, calculator, layer height, M8, optimal, prusa, prusa calculator, Scalar M, Scalar XL, Z Axis, le 20 January 2016 par Nicolas Rambaud. This probe is used on many modern 3D printers with metallic heat beds for Autoleveling purpose. It’s cheap and robust in design and can handle the heat of the heatbeds. 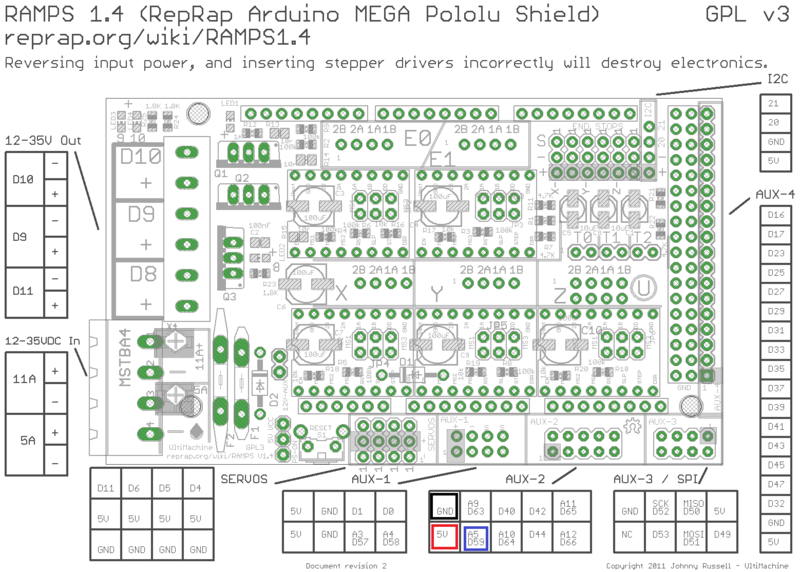 It’s always/mostly provided as a 6-36V version wich is not compatible with standard Micro controller boards requiring 3.3-5V input voltage (for most 8Bit micro controllers such as Atmega 2560). If you try to use 5V input voltage the probe won’t work at all. To asses this constraint, people are powering the probe using the 12V input voltage. The 15K resistor will be placed on the middle of the schematic. You can also use a 20K resistor instead of 15K resistor, if you keep the 10K resistor. This should give you a voltage close to 4V output also. The probe signal output voltage is slightly lower than the input voltage. So if you apply 12V input voltage you will have a signal output voltage lower than 12V. Consider this if using the alternative solutions as they might not work that well. Cette entrée a été publiée dans General Documentation, et marquée avec diagram, inductor, LJ12a3-4-z/bx, probe, wiring, le 18 December 2015 par Nicolas Rambaud.